Browns rookie running back Duke Johnson may be the biggest threat for the Ravens this Sunday. 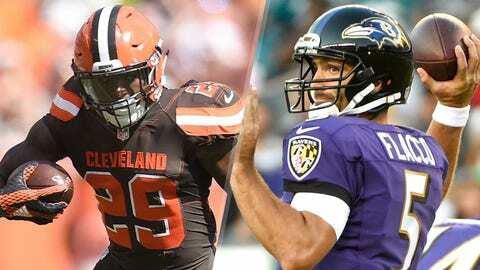 Two AFC North teams desperate for a win collide in Baltimore on Sunday as the Ravens host the Cleveland Browns. The Ravens (1-3) are coming off their first win of the season in Pittsburgh, but they’ll likely be without their best offensive weapon in Steve Smith Sr., who is dealing with microfractures in his back after a hit from Steelers linebacker Lawrence Timmons. Cleveland (1-3) will try to rebound from a heartbreaking loss in San Diego, where an offsides penalty in the closing seconds erased a bid for overtime. A third straight loss for the Browns would put them behind a big 8-ball in the division and possibly one step closer to turning the quarterback reins over to Johnny Manziel. Here are three keys to the game for both the Browns and Ravens. Without Smith, Joe Flacco’s wideouts leave a lot to be desired. The Browns’ cornerbacks should be physical with Kamar Aiken and Marlon Brown at the line of scrimmage. The longer it takes for them to get into their routes, the longer Flacco has to hold onto the ball, setting up Paul Kruger and company for more sack opportunities. The Ravens are expected to get their starting left tackle Eugene Monroe back from a concussion, but the strength of their offensive line remains on the interior. Paul Kruger and the rest of the Browns’ outside linebackers need to need to win their one-on-one battles against Monroe and right tackle Rick Wagner to stifle Baltimore’s offense. Offensive coordinator John DeFilippo hit on something last week with Johnson catching nine balls for 85 yards and a touchdown out of the backfield. Johnson was split out wide against a linebacker on his 34-yard touchdown so expect to see more of that in order to create mismatches. The speedy rookie may be Josh McCown’s best playmaker, and should be on the field as much as possible, even if that means two-back sets with Isaiah Crowell. Forsett finally got unhitched in Week 4 with 150 yards on 27 carries in Pittsburgh. He’ll need to carry the load again against the second-worst run defense in the league. The Ravens managed to run well in the fourth quarter last week despite being mostly one-dimensional without Smith — they’ll need more of the same to keep the chains moving. Putting a linebacker against Johnson in coverage is a fruitless endeavor. Facing a rather uninspiring Browns receiving corps, defensive coordinator Dean Pees shouldn’t be afraid to send safety Will Hill after Johnson. Linebackers should also try their best to get chip at Johnson as he releases into the secondary. With starter Crockett Gillmore still hobbled by a calf injury, it’s time to see what second-round pick Maxx Williams can do in the passing game. The Ravens desperately need more weapons for Flacco due to their depleted depth at receiver. Williams should get a minimum of five targets and fellow tight end Nick Boyle should also have a few balls go his way.